The Edmonton area is a major centre for pipeline connections (Alberta's Industrial Heartland - Transportation). An extensive system of more than 373,000 kilometres of pipelines called the Alberta Hub ships most feedstocks, natural gas and hydrocarbon products. Alberta’s total pipeline takeaway capacity is approximately 2.2 million barrels per day and accounts for about 65% of the value of all exports from the province. 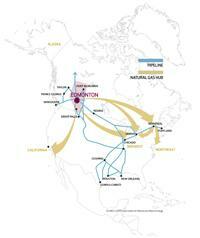 The natural gas network within the Alberta Hub is one of the most developed in the world – and can deliver up to 17 billion cubic feet per day of natural gas from the Western Canadian Sedimentary Basin to domestic and U.S. markets. Energy exports account for the largest share of Alberta’s export market and totaled approximately $64 billion for the first 6 months of 2012 and $62 billion in 2011. (Alberta Government - Trade Statistics). Ensuring hydrocarbon products can move to current and emerging markets is an important ingredient in Edmonton’s success. Feedstocks key for petrochemical processing are readily available to the Edmonton area and so is the takeaway capacity to move products to market (Access to Natural Resources and Feedstocks).